This light dinner salad is perfect for those early fall months when you’re too lazy to be in the kitchen. Edamame or baby green soybeans have a mild flavour and offer a great source of protein along with the quinoa. * From the cookbook The Vegetarian’s Complete Quinoa Cookbook by Mairlyn Smith has over 150 quinoa recipes and delves into how you can enjoy fresh, natural quinoa that is not only nourishing and flavourful, but loaded with nutrients. 1. In an 8-cup (2 L) round, preferably deep microwave dish, combine the quinoa and broth. Cover and microwave at High (100%) for 5 minutes to bring to a boil, then at 60% for 10 to 12 minutes, or until the liquid has been absorbed. Fluff with a fork and let stand covered for 5 minutes. 2. In a microwaveable bowl, combine the edamame with 2 Tbsp (30 mL) of water. Cover and microwave at High for 3 to 4 minutes, or until bright green and tender. Drain. 3. In a large bowl, toss together the cooked quinoa, edamame, red pepper, carrots and green onions. 4. Dressing: In a small bowl, whisk together the oil, vinegar, soy sauce, ginger, wasabi and pepper. 5. 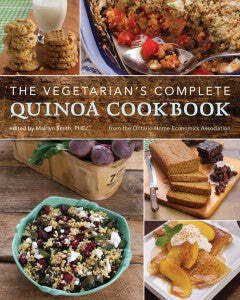 To serve: Pour the dressing over the quinoa and vegetables and toss well to coat all the ingredients. Serve immediately. Refrigerate any leftovers for up to 2 days. Note: With carrots available virtually all year round and hothouse peppers available before and after field peppers, this salad can be an all-season dish. You can also vary the vegetables depending on the season or what you have in your crisper. 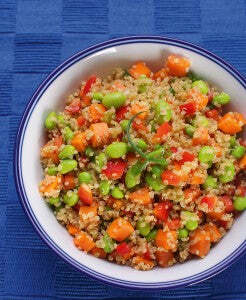 8 g fibre, 12 g sugars, 13 g protein, Excellent source of vitamins A and C.
Recipe and photo courtesy of The Vegetarian’s Complete Quinoa Cookbook by Mairlyn Smith. A multi-talented home economist, teacher and actor, Mairlyn Smith loves to add a dash of comedy to her cooking. Born in Vancouver, Mairlyn always loved the view of the mountains from her parent’s kitchen window.